In a world that reinvents itself on a daily basis, we empower students and credentialed coaches to adapt, integrate, and flourish from the inside out, for the betterment of all sentient beings. Have you ever felt like a whole week has happened and it’s only been one day? We, as individuals and as a collective, are evolving at an exponential rate. Our world is rapidly changing. With the immediate connectivity of technology and social media, what is there (besides our own self-imposed limitations) to hold us back anymore? Whether you are a fully credentialed coach, a licensed therapist, someone brand new to coaching, or someone who’s taken a few classes, our curriculum will meet you where you are and empower you to live your potential. Our intention is to support you on your path, to inspire you to embody and realize the resiliency, awareness, and connection it takes to live the good life. We believe that true change comes from within, and that global change happens on an individual basis. We’re all in this together, quite literally! When the well-being of others is at the forefront of action and inspiration, the beauty of humanity and its potential is apparent. Coaching is quickly becoming a powerful way to inspire and actualize change. To reference a quote from Ghandi, to help others be the change they wish to see in the world. The school exceeded its five-year plan in just about nine months. 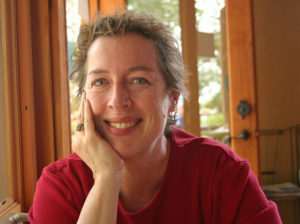 Ann-Marie wasn’t alone in wanting to create and live in a more compassionate world. There are humans around the planet seeking the same, who have been coming to the school to co-create and realize that dream. One of them might be you. 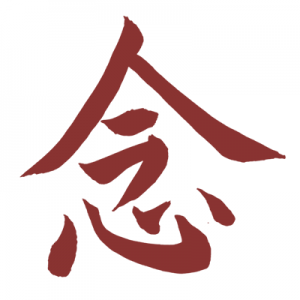 This is the Kanji (Japanese character) for the word mindfulness. It combines the ideograms for now (the present moment/that which covers all things) and heart/mind (the pairing of love and wisdom). In 2016, Ann-Marie and Brittany attended a calligraphy workshop with renowned calligrapher and translator Kazuaki Tanahashi. Inspired by the meaning and beauty of this Kanji, they decided to incorporate it into the Mindfulness Coaching School’s logo. The strength of heart and mind acting as one in the present moment felt like the perfect inspirational symbol for the mission of the school.